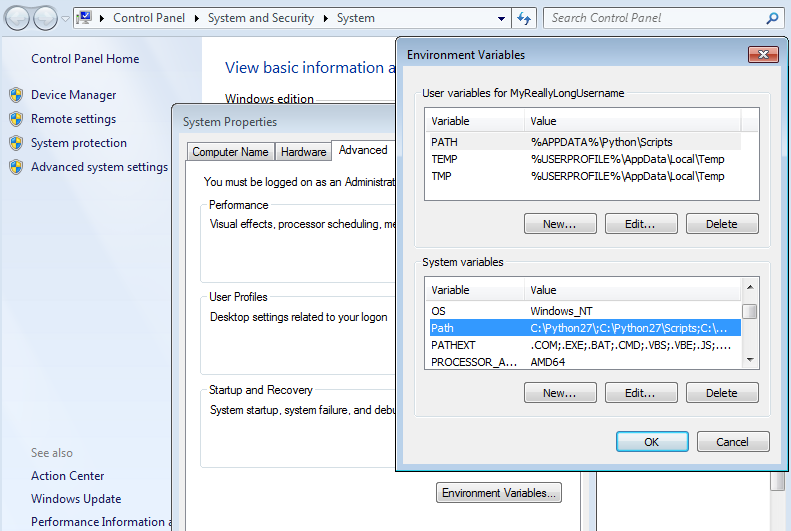 This page describes how to start using pyReScene from source on Windows. Versions 0.1 - 0.5 need Python 2.7 to run. Later versions also support Python 3. We suggest using ActiveState Python. ActivePython is the leading commercial-grade distribution of the open source Python scripting language. Download ActivePython Community Edition free binaries for your development projects and internal deployments. Download the latest 2.7 version from http://www.activestate.com/activepython/downloads. You can choose between x86 and 64-bit, x64. For just using pyReScene, this should not make a difference. You may skip the quick survey. NOTE: NumPy isn't a dependency anymore. If you want to install NumPy later on, use the 32 bit version. If this is the case, try using the regular Python distribution from http://www.python.org/getit/. You might want to use other Python distributions too. e.g. those with NumPy already included: Which Python to use on Windows for Numpy and friends? Run the .msi file. ActivePython-2.7.5.6-win64-x64.msi in my case. Keep all suggested options. You may skip the 12MB documentation though. Keep C:\Python27\ as destination. Click Yes when the User Account Control pops up. Finish. You may disable Open User Guide. If this doesn't work, start up a terminal or try rebooting. Otherwise you'll have to add C:\Python27 to your path manually. Choose one of the following three download methods. If you've been asked to use the latest code, use the second or third option. This file is only 196.0 KB for version 0.5.1. Go to https://bitbucket.org/Gfy/pyrescene/downloads and download the latest source release. For example pyReScene-0.5.1.zip. Extract the containing folder to C:\ or an other destination to your liking. This file will contain everything from the repository. This is more than 18 MB at the time of writing. This may contain untested stuff! Go to https://bitbucket.org/Gfy/pyrescene/downloads, click the tab Branches and download the zip from the default branch. Download and install TortoiseHg from http://tortoisehg.bitbucket.org/download/. Choose https://bitbucket.org/Gfy/pyrescene as source and pick a destination. Choose Clone. Typing c:\pyReScene-0.5.1\bin\pyrescene.py --help will show the help if Python is correctly installed. 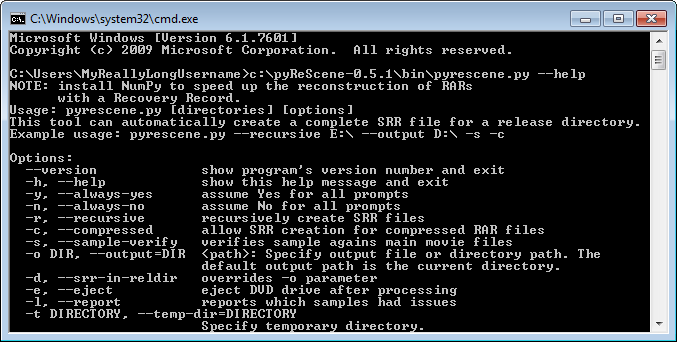 If you have multiple Python versions installed, try C:\Python27\python.exe C:\pyReScene-0.5.1\bin\pyrescene.py. You don't want to specify the full path each time you use pyrescene, srr, or srs. Place the .bat files from the pyrescene/bin/windows directory in a folder from the PATH. Better yet, add pyrescene/bin/windows to the PATH! This can be done by running pyrescene/bin/windows/add_to_path.bat, but it'll overwrite your current User PATH variable. I will create a bin folder in the hidden directory C:\Users\MyReallyLongUsername\AppData and add this to my user PATH variable by appending ;C:\Users\MyReallyLongUsername\AppData\bin. This is just a preference. If you always use the -c parameter on pyrescene for example, you can add it to these .bat scripts before the %* so it will always be used. Add a third file for pyReScene Auto: C:\Python27\python.exe C:\pyrescene\bin\pyrescene.py %*. If everything went well, you can now just type pyrescene, pysrr and pysrs in your terminal. You might need to restart it. Download the latest fpcalc.exe from https://bitbucket.org/acoustid/chromaprint/downloads or from the AcoustID website. Place it in one of these locations. I suggest you also put it in the same folder where you placed the .bat files. If it's placed in your path, enter fpcalc to test it. NOPE! The NumPy dependency has been removed by Martin Panter! Nope, that's why you should use the 32 bit ActivePython version! Didn't work immediately either, so I tried numpy-MKL-1.8.0.win-amd64-py2.7.exe from http://www.lfd.uci.edu/~gohlke/pythonlibs/ and that works. This step is not necessary if you have WinRAR. UnRAR will be used for creating SRRs of vobsubs. Download Eclipse from http://www.eclipse.org/downloads/. The standard edition will do. Eclipse Kepler (4.3.1) will work with PyDev 3.2.0. Extract the zip to your Desktop for example. Configure an interpreter: Quick Auto-Config. Wait. Finish. Yes to opening PyDev perspective. The first command will generate a ZIP with the source code. The second command will create executables. 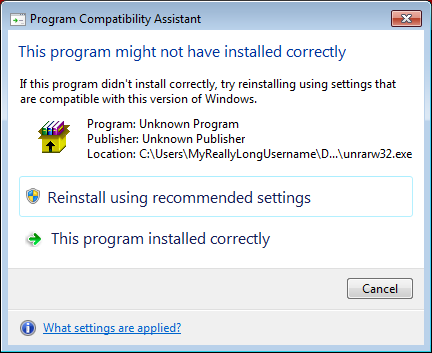 Py2exe needs to be installed for that last option. e.g. py2exe-0.6.9.win32-py2.7.exe from http://sourceforge.net/projects/py2exe/files/py2exe/0.6.9/ or use the ActiveState PyPM package manager if you are using 32 bit Python.